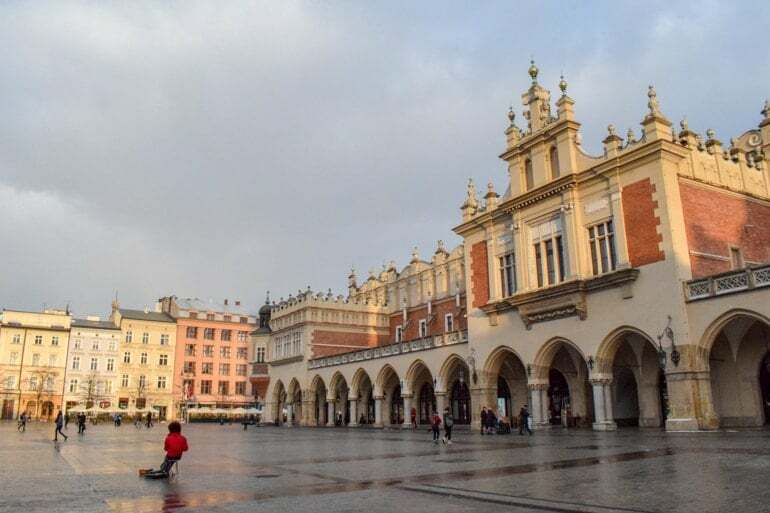 Wondering How to Spend 3 Days in Krakow, Poland? Read on! 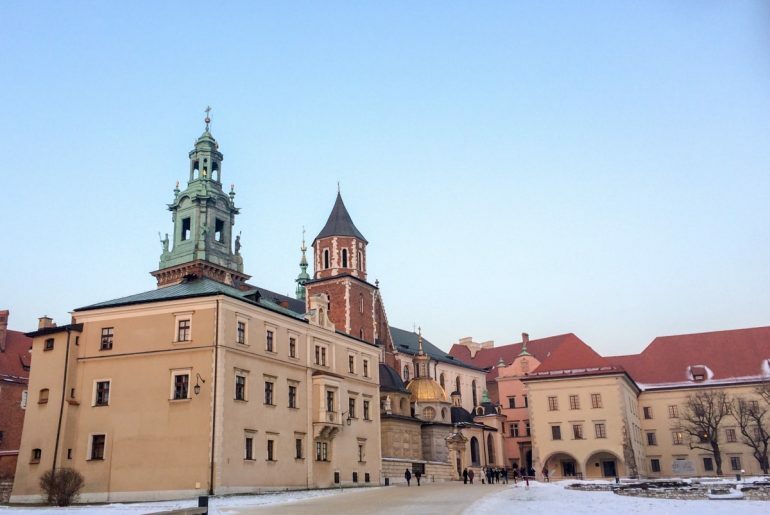 If you want to know how to spend 3 days in Krakow this is the guide for you! Eric actually has Polish roots and is well-acquainted with Eastern European foods like pierogis and cabbage rolls. Needless to say food in Poland was definitely a highlight! Krakow is an incredible medieval city that is jam-packed with history. Admittedly, we didn’t realize how much there was until we did some research for this article. We thought we did and saw a lot but it turns out there is much more to explore. Honestly. We actually wandered around Krakow on our ever first trip together. 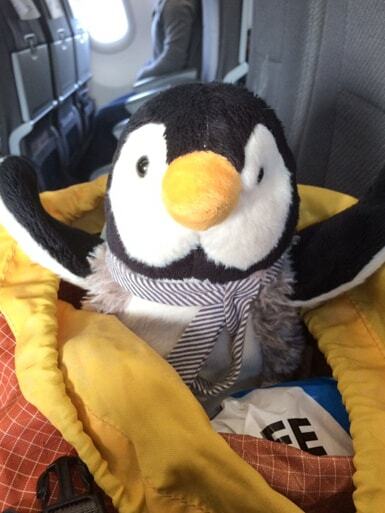 Those of you who know “Penguin and Pia” know that that is the same trip when we first met in-person… ever! You can read about our modern love story if you like. Let’s get back to visiting Krakow. Since there is so much to do and see, it’s pretty easy to spend 2 days in Krakow, 3 or even 4 days in Krakow. We spent 3 days there, and so a 3 day Krakow itinerary is what we’re going to cover! 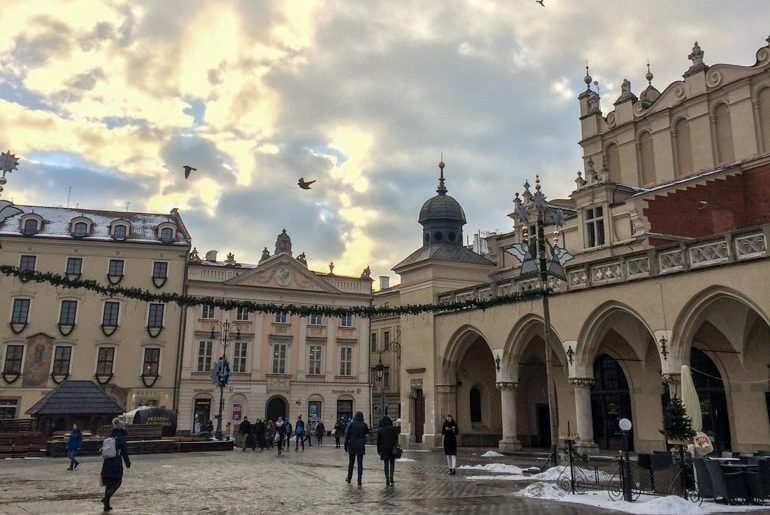 We’ll walk you through the top attractions before diving into day trips from Krakow and a few restaurants we enjoyed for dinner and coffee. Ready? The perfect Krakow itinerary is here! As a medieval and cultural centre in Poland, it should come as no surprise that there are plenty of places to stay in Krakow. We stayed in an Airbnb that was very close to the centre of the city. We had tons of restaurants close by and it was a pleasant walk to the train station. We’ve actually since written a whole guide on where to stay in Krakow that covers hotels, aparthotels, hostels, and more. Generally, lots of the main attractions are in the Old Town and so staying anywhere in there would make you close to the heart of all the action. Krakow (and Poland, in general) is quite cheap meaning you can stay in the centre of the city and not have to pay an arm and a leg **cough** Copenhagen **cough**. That said, finding a hotel just outside this area can be even cheaper and provide you with a nice little walk each day. The neighbourhoods surrounding the centre (which we cover in the accommodation post) are quite safe and all have different vibes, restaurants, and things to check out. If you are looking for a hostel in Krakow, there are also LOTS to choose from. 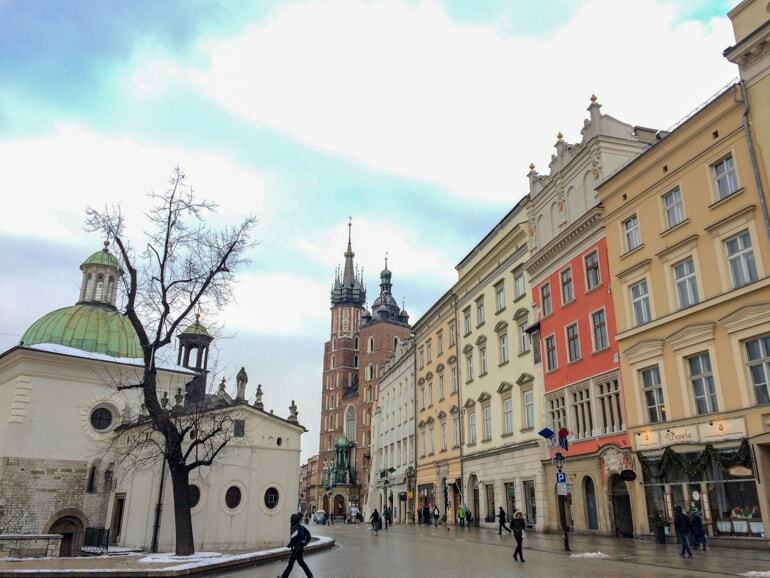 For the backpackers, Krakow is a hot destination because it’s a cheap city. Cheap typically means fun and wild in hostel life – because the beer is cheap! We’ve never stayed at a hostel in Krakow but know the most popular ones from the backpacker routes in Europe and from good friends’ firsthand experiences. Search for the best Hostel deals in Krakow with Hostelworld. For this post, we’re going to start off with a list of things you can see and do in Krakow. 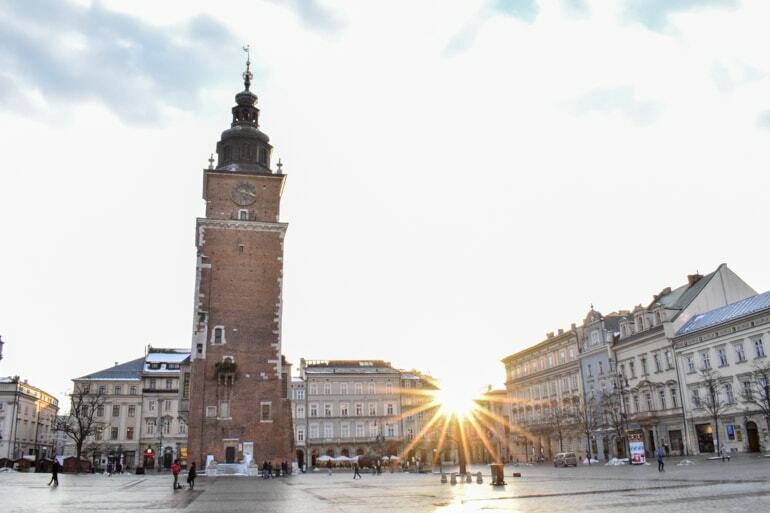 There is plenty to do in Krakow – we’ll cover a few of the things we did and few things that are very popular, as well. We’ll also cover day trips briefly since they are important for shaping your experience in Krakow and in Poland, in general. 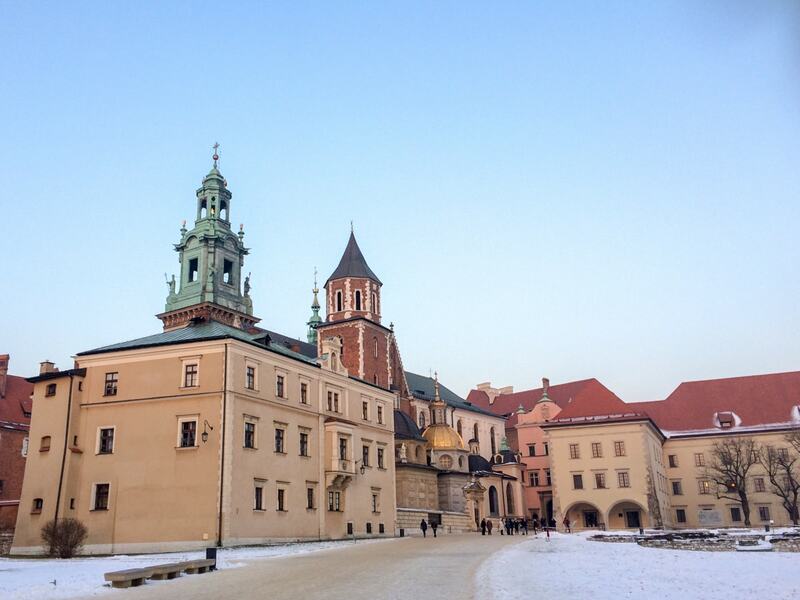 Parts of Wawel Castle – the Cathedral – are quite visually stunning. It goes without saying that Wawel Castle is a huge attraction in Krakow. Okay, we just said it anyway. Wawel Castle is a royal residence that was declared as one of the most culturally and historically significant sites in the whole of Poland. The Castle was built upon Wawel Hill, which has actually had settlers living on it as far back as 50,000 years! The first cathedral was built on the site around the year 1000 but over the years rulers have expanded it significantly. Today, it actually incorporates most of the major architectural styles from the centuries – Gothic, Baroque, Renaissance, etc. The interior courtyards make you feel tiny! The hill itself, as we said, has played a role in human civilization for a very long time. As a natural elevated area or old rock, it was a good vantage point to make a settlement on. It was also close to the river which meant having an all-important water source nearby. We wandered up there on the first evening in Krakow and we were SO lucky to catch the most stunning orange sunset we’ve ever seen. You can see the photo below. 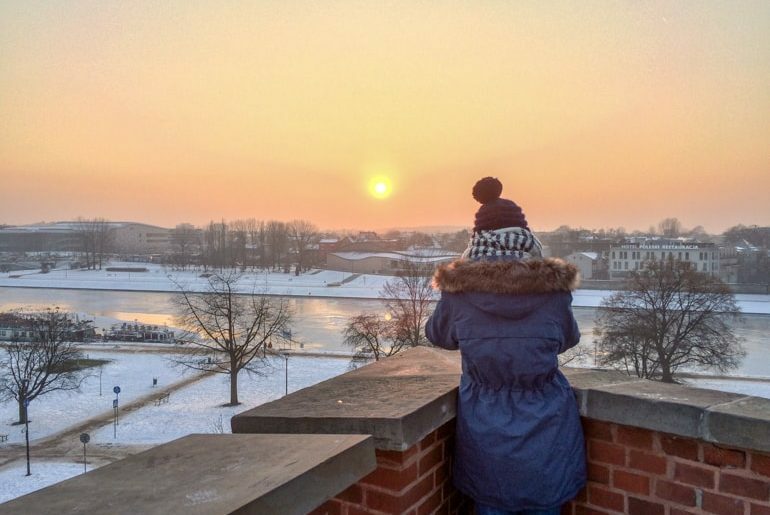 If you’re in Krakow, we’d suggest a sunset at Wawel Hill – and then, of course, see the Castle! The sunset we caught on Wawel Hill was absolutely gorgeous. You can visit the Castle on your own time and explore the grounds for free. You can go inside buildings to see the permanent exhibits, such as the Armoury, private residences, and apartments. A ticket for the Cathedral is free but you have to pay to see Sigismund Bell, the Tombs, and the Cathedral Museum. These tickets are all done separately for different areas so it’s best to go to the Castle and have a look at what exactly you want to explore. Admission prices vary AND tickets can be sold out due to daily limits on visitors so it can be best to book ahead if you know your dates. 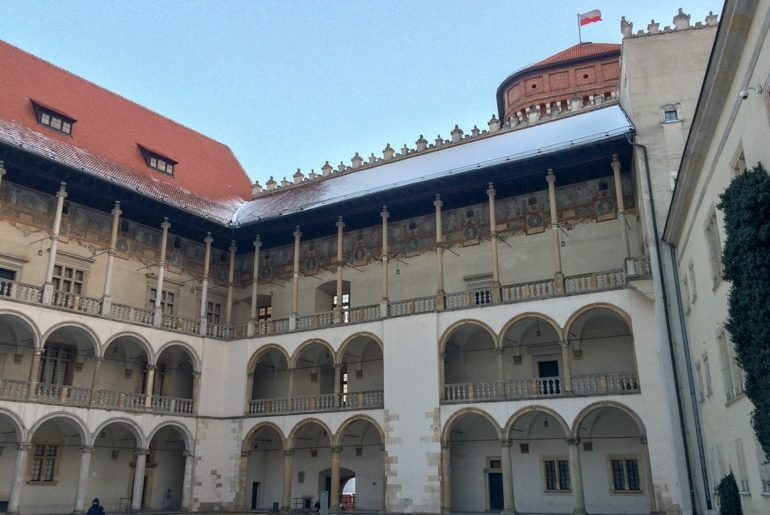 You can check out more information about Wawel Castle here. Entering the Main Square from Grodzka Street. If you know Penguin and Pia, you’ll know what we are a fan of walking tours. They just give you a great sense of the city – especially if you do them early on when you arrive in a place. We also usually opt for the free walking tours that are tip only but sometimes cities just don’t have them available. We didn’t actually do one in Krakow. We discovered most of the city on our own. While this was fine, looking back there is a ton of history to Krakow that we just didn’t learn about and we kind of regret it! Just means that we’ll have to go back. The Sukiennice – we mention the stalls and shopping inside down below! Known as the heartbeat of Krakow, the Main Square in the middle of the Old Town is a place where the world gathers in Krakow. This massive open-air square is lined with shops and cafes and has a ton of popular attractions right in the middle of it. We mention a few of them below. In this sections, we’ll cover the Square itself and the beautiful Basilica of St. Mary. The Square itself is great to wander around. There were live music buskers in a few different places throughout. You can even see one pictured above. We just listened to the music on the one evening when the sun was setting and it was a great experience. St. Mary’s Basilica and her iconic towers looking over the Main Square. 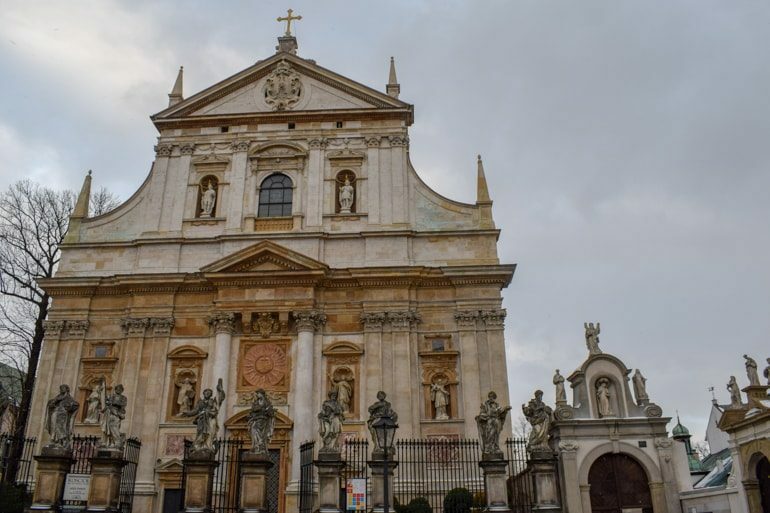 Built in the 14th century, St. Mary’s Basilica is definitely something you shouldn’t miss. As one of the best examples of Polish Gothic Architecture, the red brick church is an attraction that wows you when you see it. There is a long history about the church – form the trumpeter who was shot while warning the city of an attack to the wooden carved alter inside. General admission to enter is 10 Zlotys. It is cheaper for students and seniors, and there are limited tour tickets that run daily – except for holidays and when masses are happening. It can be a bit confusing to schedule your stay around. If you want to learn more about the Basilica, including opening hours and times for when to attend mass or a tour, check out the Basilica website. Wandering the Square beside the Cloth Hall. The side of the “Cloth Hall” has restaurants and cafes that overlook the areas of the Main Square. Obviously, they were closed off in the wintertime but still made for a lively atmosphere! We JUST missed the Krakow Christmas Markets. They were taking down the stalls when we arrived! We caught the sunset in the Square and it was awesome! As you wander around the Main Square, you’ll be overloaded by the things you want to check out or photograph. One of the taller attractions is the Town Hall Tower. Built in the 13th century from stone and brick, the tower was actually part of a larger Town Hall building. In 1820, that part of the building was demolished in an effort to open up space in the Main Square. Standing at 70 metres tall, the Gothic tower actually held a medieval torture chamber under it. Fun Fact! Today, you can go up to the top observation deck for great photos of the city from within the Old Town. There are also photographs and small exhibits to learn about Krakow’s past. To learn about the Town Hall Tower’s opening hours and prices, you can check out the website. Address: Main Square – you can’t miss it. Seriously. Packing for your Europe Trip? – Here is Our Exact Europe Trip Packing List! Also called the “Cloth Hall”, the main trading hall in the centre of the Main Square is a Renaissance masterpiece. As a popular trading hub back in the day, the Sukiennice is deeply rooted in Krakow’s past. It’s no wonder it’s a UNESCO World Heritage Site! Today, things are no different! You’ll wander through and see many shops and stall all selling different things – with upper galleries for art, restaurants outside, and cafes integrated into the building. We bought a little glass penguin there. Come to think about it, we bought two penguins in Krakow. How fitting! The Dragon – breathing fire like a good dragon should. If you’re in Krakow, you’ll start to notice that the souvenir shops are filled with dragon-related items. Why? Well, according to Polish folklore, there was a dragon living in a cave at Wawel Hill. After the dragon made the villagers fear for lives and defeated many brave knights, one boy had a smart plan and eventually blew up the dragon. That’s the short version – there’s a king involved and a bunch more details. As such, the dragon is proudly standing along the walkway at the foot of Wawel Hill beside the river. You’ll notice a crowd gathering all times of the day. This is because – every so often – the dragon breathes actual fire! It’s a cool little experience and always nice to snap a photo of when it does! 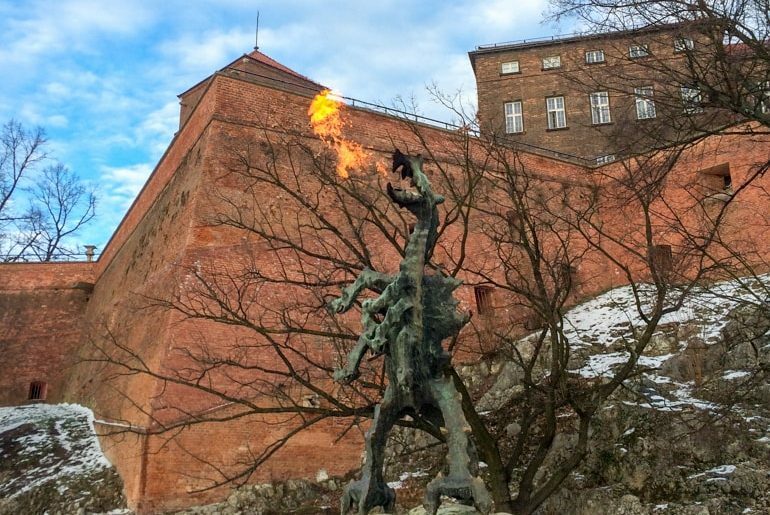 So go check out the dragon of Wawel Hill and try not to get eaten or burnt to a crisp! Remember how we mentioned that medieval Krakow had walls, towers, and gates, all the way around? Well, under Austrian rule in the early 19th century, the walls were largely torn down with the exception of St. Florian’s Gate, the two adjacent towers, and the giant Barbican close by. Today, this makes St. Florian’s Gate (Brama Florianska) a great example of the old Gothic architecture and one of the historic entryways into the Old Town. Originally built in 1300, the tower was made of stone. Brick was later added to solidify the fortifications and then the current style of a Baroque roof in the 1600s. The Barbican is a fortified outpost connected to the city walls. Built at the end of the 15th century, the main purpose was to protect the main gate (St. Florian’s). Originally, it was surrounded by a moat and connected to the main gate and outer walls by a drawbridge. It was considered one of the best examples of fortified military architecture given that the walls were 3 metres thick and was designed for both military defense and offense. Visitors can purchase a ticket to explore all of the remaining fortifications for the price of one during opening hours. A general admission ticket is 9 Polish Zloty (approx. 2 Euro). This ticket can be purchased at the Visitor Centre ticket office located in the Cloth Hall in the Main Square. You can read more about these awesome attractions at the official website. Address: The Gate, Towers, and Barbican north end of the Old Town in/around Planty Park. The toys are such high quality and adorable..
…And, that’s how we ended up with Pia! One evening, we were walking home a different route when something fun caught our eye. It was Bukowski Toy Store. Having explored a giant toy store in Prague we decided to pop inside. 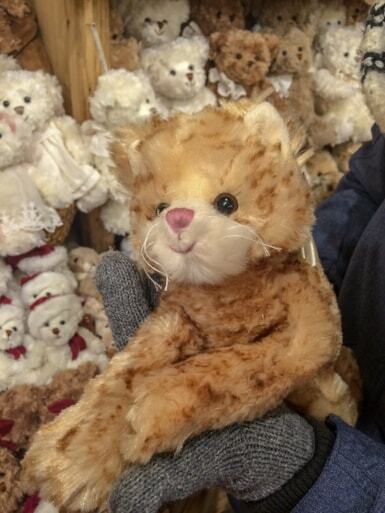 We were greeted by – and we kid you not – thousands of stuffed furry faces looking back at us. Animals of all shapes, sizes, and kinds of animals. We decided that while they were cute, we didn’t need anything. However, Lisa did find a penguin that she grew fond of. It was also the only one that we could see. Eric also thought she was pretty cute. But we were on the road travelling and didn’t have space in the bags. So, we made a deal: we would come back to the shop before we left Krakow and if it was there still – we would buy it. Fast forward two days – we enter the shop again and can’t find the penguin. We were pretty sad – and then realized how much we actually grew fond of the damn stuffed animal in the short time we had held it. We were searching the store when Lisa exclaimed from another corner. There, she had found the penguin. Eric grabbed it from her and literally ran to the cash register – this penguin was ours! We left the shop all smiles, and Lisa named her Pia – to go with Penguin (who was at home waiting). And that’s the story of how we bought Pia – the inspiration for this very travel blog! If you want to explore the shop, check out the website for Bukowski’s here. The Jewish Quarter, also known as Kazimierz, is an awesome district to wander around and explore. As with many other big centres in Europe, the Jewish Quarters are full of history (both positive and through darker times). Krakow’s Jewish Quarter is no different. For over 500 years, the area was the centre for Jewish life in Krakow. During the Second World War, many of the Jewish inhabitants were relocated from the district into the ghetto across the river. The area fell into despair during the Communist Era and has since seen a revival of culture, food, and energy. In fact, it’s considered one of the best-preserved examples of pre-war Jewish lifestyle and culture. Our Airbnb was right on the border of the Quarter and we thought the area was super cool. There were a ton of restaurants and lots of green space where we stayed. It was also super close to walking to the centre of the Old Town so that was a bonus. All in all, we’d suggest a wander around the Jewish Quarter starting at the main market street Ulica Szeroka. You never know what you may find! Go for a wander – you’ll end up somewhere interesting for sure! If you are looking for things to do in Krakow, you’ll find plenty of interesting things if you just wander the Old Town! Called the Stare Miasto in Polish, the Old Town is full of winding streets, alleyways, churches, restaurants, statues – you name it. If you want od o any shopping, this is also one of the places where you can do that. You’ll find some of the big brands here mixed in with the souvenir shops and the local shops on the lesser travelled streets. Wandering the Old Town is how we found Pia (the penguin, as you read above), how we found the cafe we went to, and generally how we get our exercise. We like just taking in the sights and sounds of a place rather than have a rigorous schedule. Krakow was a great city for that. We just kept making directional decisions and eventually, we had gone in a massive circle and seen lots of points of interest! Want to learn about Polish history through art? Then a stop at the National Museum in Krakow is for you. While the “National Museum” is actually a term for a variety of galleries and standalone buildings around Krakow, the main building located at the address below is the hub for Polish modern art, decorative art pieces, and war-time memorabilia. You’ll find it located just on the border of the Old Town. The other collections are scattered around the city. For example, there is a gallery of just 19th-century Polish art located in the upper parts of the Cloth Hall in the Mina Square. The hours for the different branches and galleries can vary – best to check the website for the ones that interest you! Lisa loved photographing the theatre! 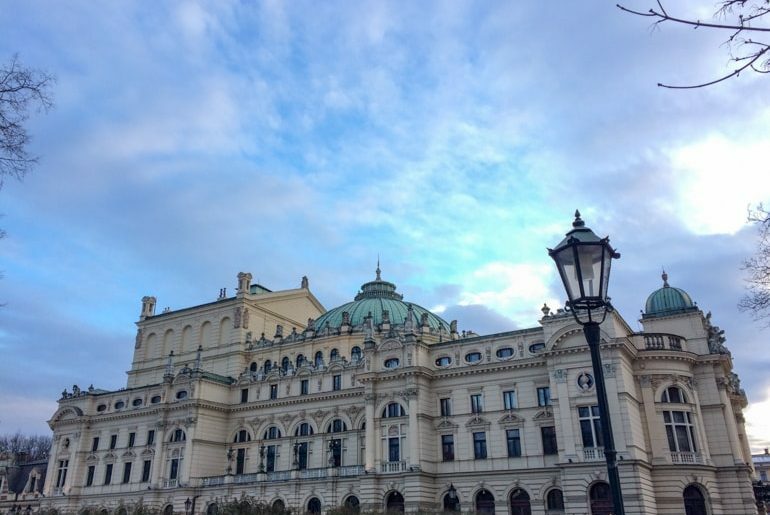 Located in the north end of the Old Town, you can’t miss the Juliusz Słowacki Theatre if you’re walking the garden footpaths near the old town entrance at St. Florian’s Gate. Known in Polish as the Teatr im. Juliusza Słowackiego, the building was first opened in 1893! The theatre was modelled after some of the most beautiful Baroque theatres in Europe and was named after a Polish poet decades later. If you check out the calendar on their website, you’ll find lots of repeat performances with a variety of productions that come and go based on the season. Here is the theatre’s website to check if there’s something on when you are visiting Krakow! The church is gorgeous from the street outside. Created in the early 1600s, the Church of Saints Peter and Paul stands as a significant piece of Poland’s religious history. The church was the first built in Poland to be entirely in the Baroque architectural style. 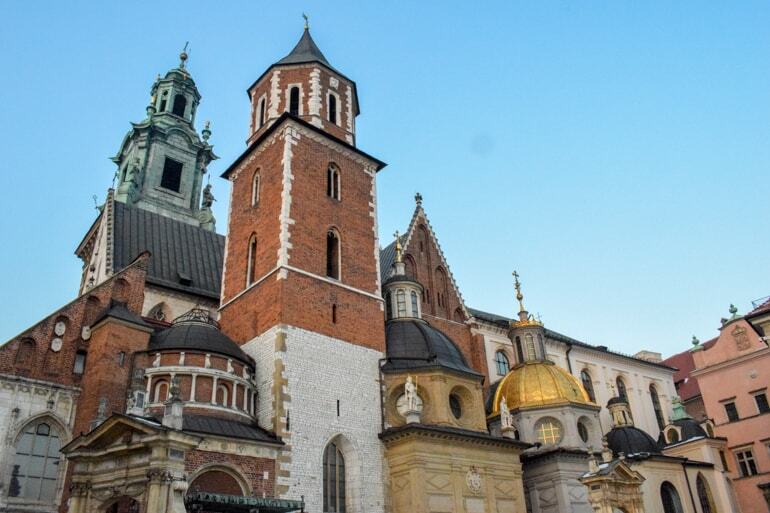 As for size, it is the largest (by seating capacity) of the historic churches in Krakow. You can find the church close to St. Maria Magdalena Square in the Old Town. We were walking Ulica Grodzka from the Castle/our Airbnb and there was the church just sitting pretty. So, we had to snap a photo. If you want to go inside, it’s free to enter. However, there are concert performances that you can attend for a fee and apparently, the acoustics are amazing in the church. Check out the note for more information! Want to get amazing views of Krakow and the surrounding area? Then hike up the Mound and take it all in! The Mound was built in 1823 entirely by volunteers workers and locals who gradually brought dirt to the site to create the mount as a museum and to commemorate the Polish War Hero Tadeusz Kosciuszko. The surrounding fort was built later, was partially destroyed, and has since been rebuilt – serving as a great way to learn about Polish military history. Ticket prices go towards keeping the fort and the Mound maintained and preserved for generations to come. You can learn more about the opening hours and prices on the official website. The birds hanging out near the Castle on the river’s edge. 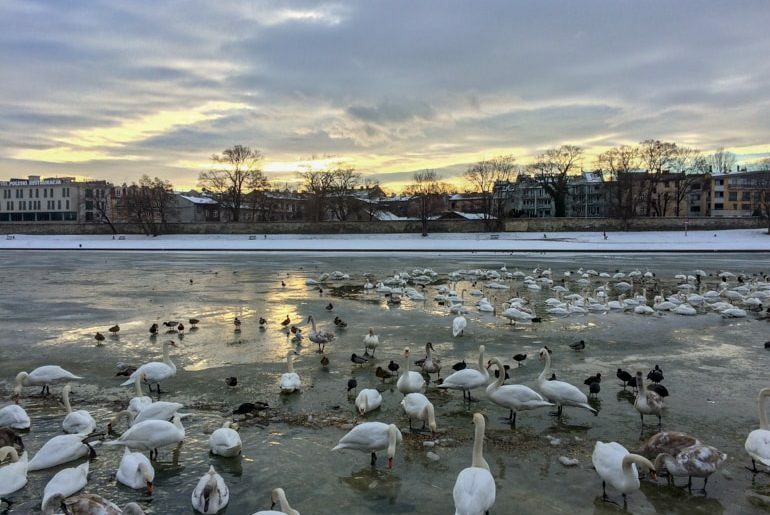 If you are feeling up for a wander, simply walk along the Vistula River. You’ll pass through different districts on the nice walking paths and each of these places can be explored if you like. There are also many attractions along the river like the Wawel Dragon and if you walk far enough west from the Old Town you’ll end up at the green space near the Mound! There were lots of birds when we went and since we get enjoyment from basically all animals these birds were a treat. By now, we’ve mentioned the park that surrounds the Old Town a few times. This is for good reason – it’s beautiful! Planty Park is the ringed walkway that encircles the Old Town with old trees and many old historic structures to enjoy along the way. The park basically runs the former route of the medieval walls and moat when Krakow had fortifications around it. We strolled the park in both directions and even in winter enjoyed the walk. We want to come back in summer or autumn to see the leaves all different colours and to enjoy the warmer weather! Błonia Meadow is technically a park that you’ll find due west of the Old Town. This massive open green meadow is a popular spot for enjoying the sunshine, has bike paths, and serves as a great venue for events going on in the city. We didn’t get a chance to wander through but know that it’s a nice escape from the city… yet still very much in the city. Krakow is a great city full of history – but it’s no secret that in the surrounding area, there are LOTS of great day trips you can take. In fact, Krakow (the city) has to compete with two of the most-visited spots in all of Europe: The Wieliczka Salt Mines and Auschwitz-Birkenau Concentration Camp Memorial and Museum. We were, fortunately, able to visit one of them, and we will definitely visit the other one when we go back! We also plan on writing a whole post on our day trip to Auschwitz-Birkenau in the future so stay tuned for that. If you’re going to Poland, you might get asked “oh, are you going to see the Salt Mines?” .. and that would be a fairly reasonable question. Most people know about the attraction but don’t even realize which city it is close to! The Wieliczka Salt Mines are located in – you guessed it – Wieliczka, which is technically in the greater Krakow area. With over one million visitors each year, the mines are a VERY popular attraction – and for good reason. Originally opened in the 13th century, the mine produced table salt until 2007 – making it one of the oldest salt producing mines in the world. Today, the mines are an attraction with carved statues and four chapels deep in the interior – all created from natural rock salt. There is an underground lake, a larger events room for weddings and functions, and a tour route that takes visitors 3 km through corridors and shafts to explore the mine. The mine actually became a UNESCO World Heritage Site in 1978 and is considered one of Poland’s Historic Monuments. If you want to check out The Wieliczka Salt Mines, consider booking a tour in advance since the summer season can get quite busy with visitors. There are lots of different tours that will take you directly there from Krakow, while others just cover the entrance ticket. Check out this The Wieliczka Salt Mines tours page for the tour that works best for you when you’re in Krakow. Another one of the most popular day trips from Krakow is one with a slightly darker history. Located about an hour west of Krakow by bus and train in the town of Oświęcim is the infamous Concentration Camp of Auschwitz-Birkenau. Now a memorial and museum, the area is broken up into Auschwitz I (which was the main camp Auschwitz) and Auschwitz II (which was the larger camp at Birkenau). Auschwitz I is where you start your tour. The museums and exhibits provide you with all the information needed to set the tone to understand what you are witnessing. We had a live guide but we also had headphones which made it clear to hear her at all times so she didn’t have to shout. Overall, the experience was very well done. Having an interest in the Second World War, Eric had always wanted to visit to learn about what happened. We learned quite a bit – and now we’re telling you to go and experience it for yourself so that we don’t forget the lessons learned. As a German, Lisa thought it was important to learn about her country’s history for much the same reasons as Eric. We then went to Birkenau for the second half of the tour. We hopped on a minibus from Auschwitz I and drove for about 5-10 minutes. Once there, the tour continues with the same guide who takes you through the grounds as you learn about the past. We’re not going to give away all the details but the experience is very well done and immensely heavy. There are many memorials on the grounds. Some of the buildings are still standing while many were destroyed by the Nazis before they evacuated as Allied Forces marched through Poland. We visited on a day that was absolutely freezing cold and it made the experience even more real for us personally. We were heavily bundled for the Polish winter and inside the sleeping barracks, it was freezing cold. We can’t imagine what people went through so many decades ago. 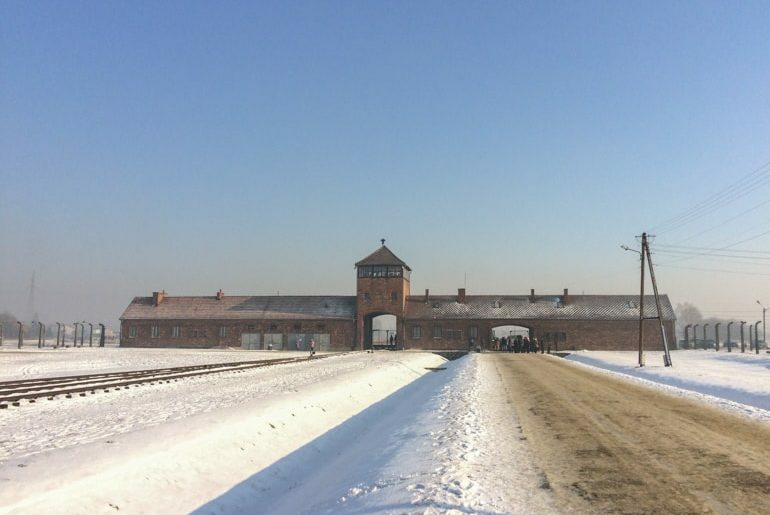 If you want to visit Auschwitz-Birkenau, you can buy tickets online and take the regular bus from the Krakow Bus Station (located behind the main train station). This is what we did and admittedly, finding the bus station and making the early bus was a little stressful. That was also in the off-season so we don’t know how bad the lineups for buses are in the summertime. Alternatively, you can book a tour that takes you from Krakow and includes your entry ticket into the Memorial and Museum. 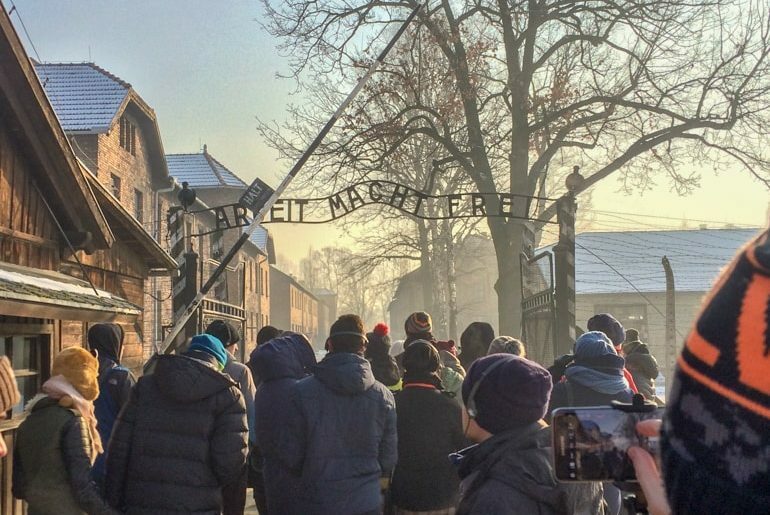 Check below for the Auschwitz-Birkenau tour that fits best for you! While we didn’t eat out a ton while in Krakow, we were super happy with the places we did get to enjoy our dinners and coffee break. We’ve included those places as well as one place that is highly recommended but we just didn’t have the time to get to because we did a day trip. If you want a sweet treat and a warm beverage then Choco Cafe is the place for you. Choco Cafe is located just off of the Main Square so very much in the touristy area. That said, it didn’t feel artificial like other tourist hot spots can be. We actually popped in on our first evening in Krakow having done very little research! But, we wanted a place to escape the cold and the treats looked awesome. You’ll see once you get there – inside there is a massive glass case full of the cakes and other goodies waiting for you to order. It’s very old and cozy inside, too. We both had a coffee (latte and an Americano) and treat to share. The staff was very friendly and overall we had a cozy time in a Krakow cafe. To check out the photos, check out the website for Choco Cafe. If you want a great breakfast/brunch place, then Milkbar is for you! Located very close to St. Mary’s Basilica in the Old Town, Milkbar specialized in Polish cuisine and other brunch items that are sweet or savoury. We didn’t get a chance to go because we mostly cooked in our Airbnb but we had seen it (and how highly it was rated) and planned on going. Again, it’s one of those “we’ll get there next time” kind of things! The place is quite small so keep that in mind when you go – the wait might be longer than expected and you might have to share a table to get everyone in! They don’t have an official website so you can check out Milkbar Tomasza TripAdvisor if you’re curious! The crepes look really good. Pierogi on the plate with sour cream. Heavenly. Of course, we weren’t going to tour through Poland without having authentic Polish cuisine. This included pickles, cabbage, and, of course, pierogies. Basically what Eric grew up eating! We didn’t go wrong choosing Pod Wawelem as our place to try out! Located very close to Wawel Castle, Pod is described as the touristy place that everyone goes to because it truly is one of the best options for authentic cuisine and a great Polish meal experience. They do a great job. The food was delicious, the drinks were cheap, the portions are huge, and the service was awesome. The interior is a vintage, beer-hall style, cozy kind of place that is welcoming to everyone just looking for some good food. 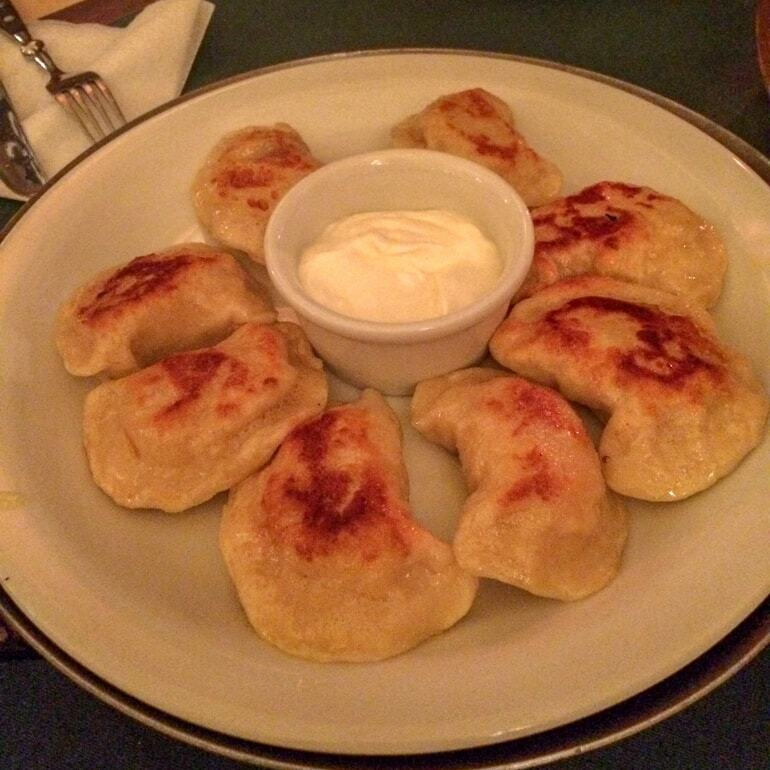 Oh, and yes – the pierogies and the pickles were just like his grandma used to make! You can check out their website for the menu and opening hours. Yes, we went for sushi in Krakow. We were craving sushi and figured we would try out a place in Poland. This turned out to be a great success. We stumbled upon Genji because we walked by many times to and from our house to the Old Town. The overall experience was amazing. We were greeted kindly and led downstairs to where there is an old brick cellar. Each of the little rooms is like a private grotto. There are a table and a curtain and a buzzer for calling for service. We felt bad ringing it but it was great for water refills when needed. The dim lighting made the atmosphere really cool, too. Of course, we were hungry and the best deal was ordering a sushi boat with a few rolls on it. You can see from the picture above – the quality was really good! The price wasn’t even that expensive considering the freshness of the sushi during he Krakow winter season! 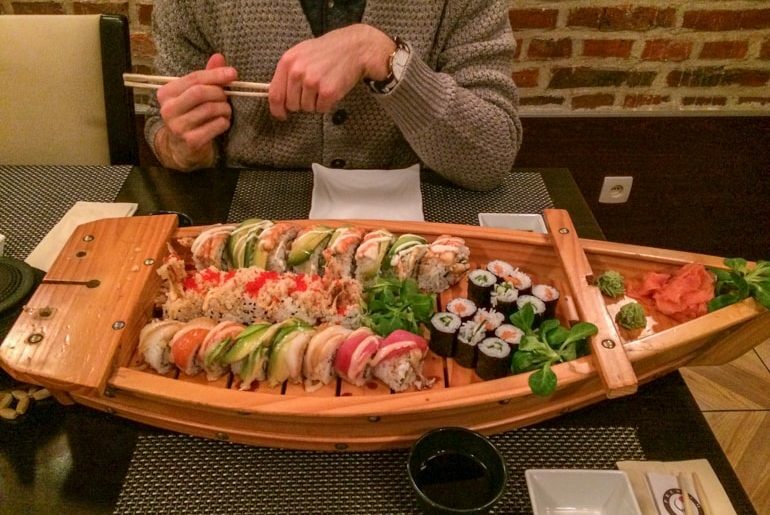 We’d recommend trying it out if you want sushi in Krakow. If you want to view the menu, check out the website. 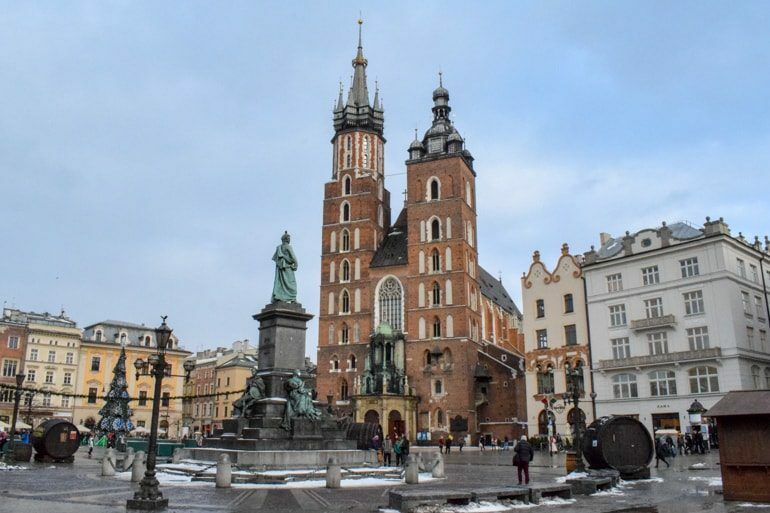 Now that we’ve given you plenty of ideas of what to do, see, and where to eat, we wanted to give you a quick breakdown of a possible 3 Day Krakow Itinerary. You can obviously swap out what you want to see – this is just a template! Morning: Start your day with Brunch at MilkBar, then do a walking tour of the historic old town Krakow! Afternoon: Head over to the “Mount” for the hike, views, and the old fort museum. Evening: Go to Pod Wawelem for a great dinner and a few drinks. 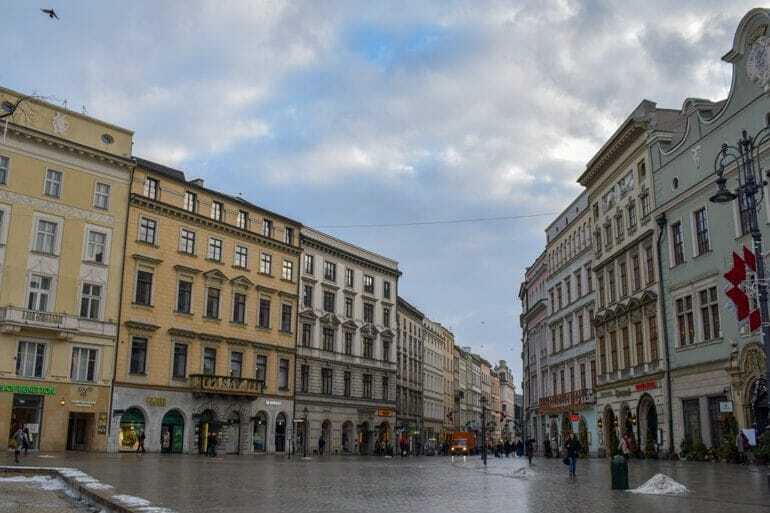 Morning and Afternoon: Grab a quick bite in the Old Town and hop on a bus/train to Auschwitz or The Wieliczka Salt Mines. Evening: Eat dinner in the Jewish Quarter (Genji if you like sushi), and have a relaxing evening walking the River. Morning: Eat a breakfast and then visit St. Florian’s Gate, the Barbican, and the Old Fortified Towers. Afternoon: Have lunch, then head over to Wawel Castle on Wawel Hill for a tour and the views. Evening: Dinner in the Old Town, then see a performance Juliusz Słowacki Theatre or head up Wawel Hill for sunset. And there you have it – our take on some of the best things to do in Krakow! What do you think? Since we only spent a few days in Krakow as part of a much larger trip, we know that we need to go back and do so many more things. Ultimate, our first trip was just a sampler trip of quite a few places – and now we are really wanting to get back to most of them! If you end up in Krakow, let us know what you think! We’d love to hear what you think of this Polish city!